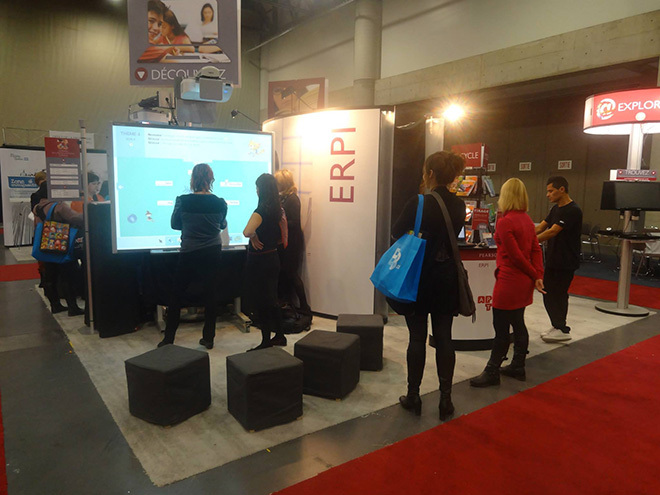 Our client, Pearson ERPI, attended an educational trade show last week in Quebec, the Association quebecoise des enseignantes et des enseignants du primaire (l'AQEP). They showcased, among other things, an application that we have been working on for a year. You can read more about it in our portfolio. In short, it's an educational application that teachers and students use in the classroom on a SMART Board. That's it below on the blown-out big screen. Here is another one of Décimale, math skills for third and fourth graders. Skip to about 6:30 to see the Interactive Number Line Tool. I am capitalizing that because it was a challenging one. But as she says, it turned out to be "phénoménal."